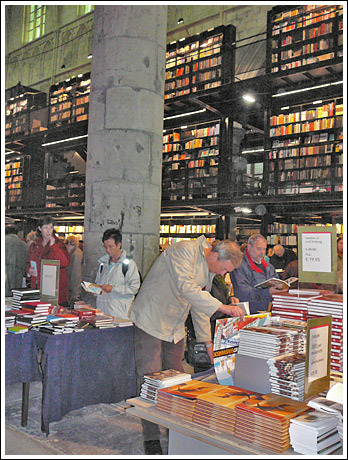 There was much interest for Maastricht’s impressive new bookstore last Saturday afternoon. Selexyz Dominicanen, as it is called, is located in the city’s old Dominican Church. After many months of renovation the magnificent building is finally ready for its new purpose. Selexyz Dominicanen is the result of a merge between Maastricht’s Bergmans bookshop and the Academische Boekhandel. The name Selexyz indicates that the new bookstore also belongs to the same chain as Selexyz Donner in Rotterdam and Selexyz Broese in Utrecht, among others. One of the most attractive characteristics of Selexyz bookstores is that they (usually) offer a wide selection of books in English… and at first glance, Selexyz Dominicanen did not look disappointing at all in that department! In order to emphasise the medieval origins of the Dominican Church, there was a small medieval market at the entrance of the building. Visitors were also entertained with fighting demonstrations and medieval music. The Dominican Church is located right next to the entirely redesigned Entre Deux shopping centre and close to Maastricht’s famous Vrijthof square. The new bookstore will certainly contribute to attracting even more customers to the area. It seems unbelievable to think that the beautiful church once served as a parking garage for bicycles! On my first visit to Selexyz Dominicanen, Maastricht’s new magnificent bookstore, the upper floors were not accessible to the public yet. Now they are, and here’s what they look like. Did you notice the cross-shaped reading table? Everyone is welcome to take a seat and go through some of the magazines and newspapers that are kept in the gaps that run through the middle of the table. Selexyz Dominicanen also organises many literary activities (mostly in Dutch), such as interviews with writers or book signing sessions. Have a look at the bookstore’s website for the detailed calendar of events.